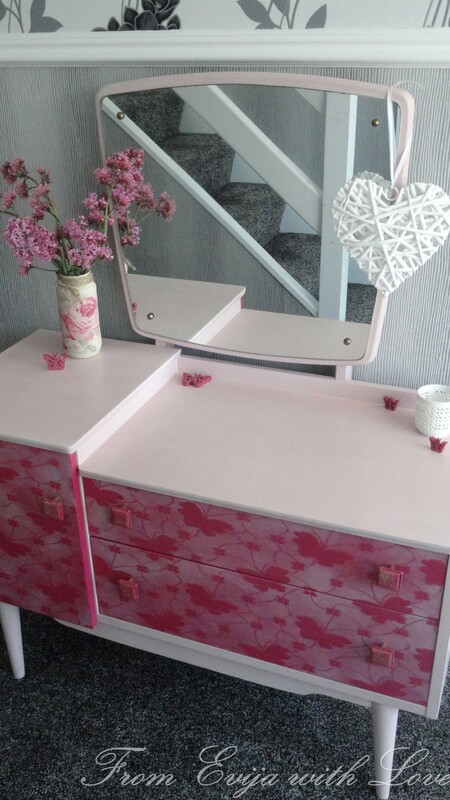 The Fab Flippin’ Furniture Contest – From Shabby To CHIC! Hi everyone, I am so excited to tell you that I am taking part in a fantastic competition this month called “The Fab Flippin’ Furniture Contest” organised by a group of wonderful bloggers and this month hosted by Charlotte at Ciburbanity and Carrie from Thirty Eighth Street. Not only you get to showcase your piece, your transformation and get opportunity to be featured on these blogs, you also get a prize! This month The Old Fashioned Milk Paint Company is the sponsor of the contest! This competition runs monthly and each month there is a new theme. This month’s theme is – Shabby Chic Storage! I love shabby chic items, so I thought it would be so easy.. but once I started thinking I had so many ideas and wasn’t sure which one to go with.. 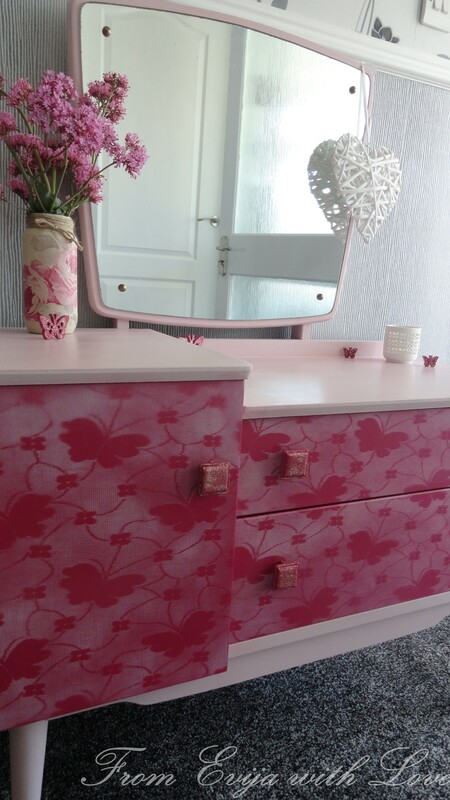 I decide to test myself a little and try to transform this old dressing table. This was definitely more shabby than chic.. I found it abandoned and thought it would be perfect for upcycling it for the Fab Flippin’ Furniture Contest. It needed some fixing before I could actually create what I had in mind, but after some wood filler, lots of sanding and cleaning the piece was ready to be transformed. I used Annie Sloan’s Antoinette for the base colour. As I wasn’t happy with the piece as I thought it was looking a little plain in just baby pink I decided to use a bit of lace painting for this project. I ended up injecting some deeper colour in this piece as I thought it would give a better effect and to be honest I am so glad I went for it!! I had a net curtain with beautiful butterflies which I thought would be perfect for this theme. I placed the net curtain over the drawers and the shelf and sprayed some matching baby pink spray paint over. I took the lace off….. and Loved the effect..
and then it was done.. From shabby to chic!!! Charlotte from Ciburbanity Lynn from Fern Avenue Michelle from Dandelion Patina Carrie from Thirty Eighth Street. The Fab Furniture Flippin’ Contest is open only to the entrants who have signed up through the group Facebook page. If you are an active, furniture flippin’ blogger, and you’d like to participate in future contests, we’d love to have you! Please contact Evey (info@eveyscreations.com) or Stacy (info@anastasiavintage.com) to find out how! You are soo talented! Love this!Good luck, you truly a winner! This piece totally inspired me to watch one of my favorite Molly Ringwald movies, Pretty In Pink. I love your creativity in transforming this piece. Thank you for participating in the FFFC. I will be pinning your project to our Pinterest board. So very pretty in pink! I showed my daughter and she absolutely loved it! Another lovely transformation! Love the inspiration for the knobs. We’re painting my daughters dresser, and I’ve been looking for ways to DIY and beautify the ugly knobs that came with it! Thank you for sharing! It’s fun co-hosting #OhMyHeartsieGirlsWW with you! Enjoy your week! 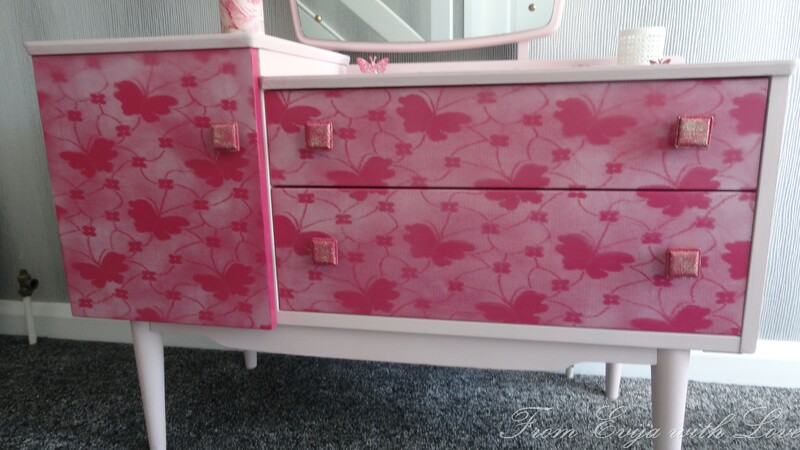 Your dresser turned out so nice, I love how you used the lace to transfer the design and the color effects, you id a great job, saved an old dresser!!! Wow, what a fabulous paint transformation. Love the color and the glittery knobs. Thanks so much for sharing at Vintage Inspiration Party. You are truly talented! I love your work and you inspire me. Your post make me look at old furniture with a new eye. It’s great to co-host with you this week at OMHG WW. I LOVE what you did! You are so creative and talented! All the best in the competition!